Garmin iQue 3000 GPS-enabled PDA is an entry-level Palm Powered personal digital assistant (PDA) that offers fully integrated Global Positioning System (GPS) technology. 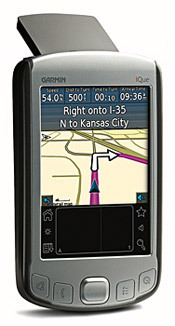 Garmin iQue 3000 Que technology connects the Palm Address Book and Date Book to the GPS electronic map so that users can navigate directly to a specific address from the user’s contact database or date book. Garmin’s industry-leading navigation database allows the user to look up nearly six million points of interest, such as restaurants, hotels, transportation hubs, and banks. Premium-quality map data is provided by NAVTEQ. BrightHand reviews Garmin iQue 3000 GPS PDA and concludes that a decent but not extraordinary GPS-oriented handheld, the main draw of the iQue 3000 is that it’s simple and durable. If you require GPS on hand all the time, plus basic organization and PDA functions, this might make sense. For most people, though, the 3000 has little to no benefit over a Bluetooth GPS receiver and separate handheld. The Tungsten E2 and a SiRF III-based Bluetooth GPS would give you better performance with a lower price, while a Dell Axim or Palm TX and Bluetooth receiver would provide greater functionality and features for an equivalent cost. Garmin iQue 3000 is a one and a half trick pony which may work for a few folks, but isn’t going to set the world on fire.